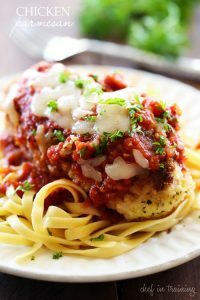 This Chicken Parmesan is simple and packed with yummy flavor! It is sure to be a hit with the entire family! If desired, you can pound chicken breasts to a half inch thickness for faster baking time. In shallow bowl mix eggs with fork and set aside. In a Zip-lock bag, or deep dish, combine Panko crumbs, 1 cup Parmesan cheese, salt, pepper and basil. On a shallow plate add 4 Tablespoons flour. Dip and coat chicken in the flour and then in the egg mixture, shaking of excess egg. Next, dip chicken into the Panko mixture. After dipping, place chicken into the hot oil. Cook chicken for 2 minutes on each side and then transfer to the 9x13 baking dish. Pour marinara sauce over chicken and bake for about 20 minutes. While chicken is cooking in the oven, mix together provolone cheese and mozzarella cheese in a small bowl. Sprinkle over chicken for the last two minutes of baking. Check chicken to make sure it is cooked through before adding cheese. Serve over fettuccine pasta or whatever your desired pasta is.